According to ABARES, the average rate of return (excluding capital appreciation) for grain farming businesses was 4.5pc in 2016/17, above the 16-year average of 2.4pc. 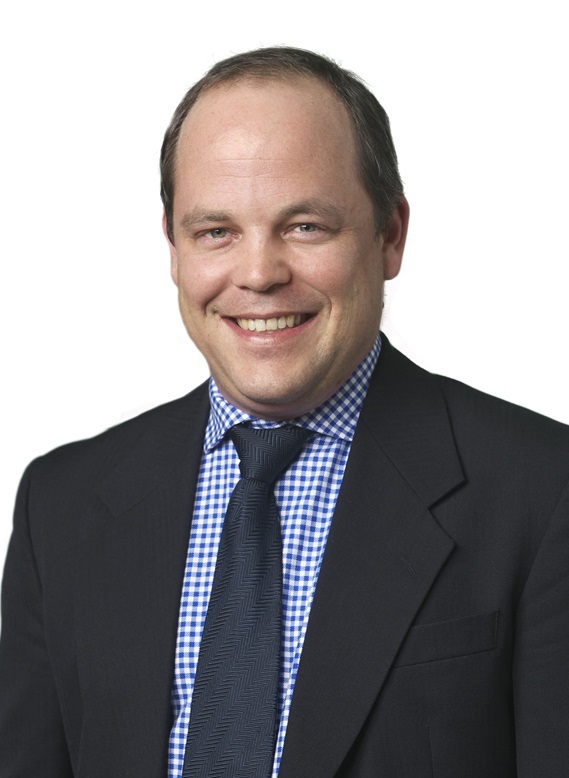 ABARES noted that performance varies widely between individual farms. Even in 2016/17, 19pc of grain farming businesses recorded negative rates of return, with only 12pc of businesses achieving returns above 10pc. A solid marketing strategy will go a long way to elevating returns into these higher percentage brackets. Farming is generally low-margin, but there’s tremendous range between best and worst performers. Margins in farming businesses can be tight and volatile, but the top farming enterprises are moving ahead. A big reason for their success is simply acknowledging weaknesses or gaps in their expertise. Instead of trying to be a jack-of-all-trades, farming businesses need to focus on their strengths in management and production, and get help from independent professionals in the marketing of their grain. Good independent grain-marketing advice should show growers opportunities to maximise the value of grain produced, and to handle risk appropriate to their farm business. Good advice will ensure growers avoid pitfalls and sidestep expensive mistakes. This was evident in the 2007/08 season for farmers managing new-crop price risk during the growing season. There was a good start to the season, and growing popularity in the use of derivatives (mainly OTC Swaps) to manage price risk, with most farmers doing so without independent advice. As the crop started going backwards in late winter/spring, prices – already in record territory – continued to push higher. Instead of reducing hedge positions in line with the crop prospects in the paddock, many farmers doubled down and sold more to “average up”. The outcome was widely publicised – large debits on swap positions without the physical tonnes to offset. Two key factors were lost in the reporting at the time: first, because the domestic market was far more sensitive to the Australian drought than the offshore market, washouts on physical contracts were significantly greater than washouts on swaps, and second, that financial pain was in many cases due to the misuse of products, not the products themselves. The media blamed the gun and not the one who pulled the trigger. There’s no doubt there are risks involved with hedging pre-harvest, and 2007/08 was a brutal example that forward contracting is far riskier. The situation also should have illustrated the merits of low-risk pre-harvest put-option strategies but, a decade on, understanding and adoption remains limited in the grower space. Progressive and innovative farmers have put increased value in good independent grain-marketing advice, and have taken their grain-marketing returns to another level. Many others, instead of acknowledging their lack of expertise in this area, threw the baby out with the bathwater and turned their back on derivatives. To make matters worse, many growers were fully exposed to a significant fall in 2008/09 prices. Regrettably, these growers “paid the high and sold the low”. Those who understood the benefits of more strategic grain marketing kept their eye on the ball and took advantage of the high prices to start hedging the 2008/09 crop, and were protected as prices for that crop fell substantially during the growing season and into harvest. Chart 1: 6 year average for Kwinana APW1 cash bid (green line), CBOT December wheat futures (black line) and basis (cash minus futures – grey line). Not only does forward selling expose businesses to excessive risk – compounding the production risk that already exists – this strategy has been proven to leave significant value on the table compared to hedging. 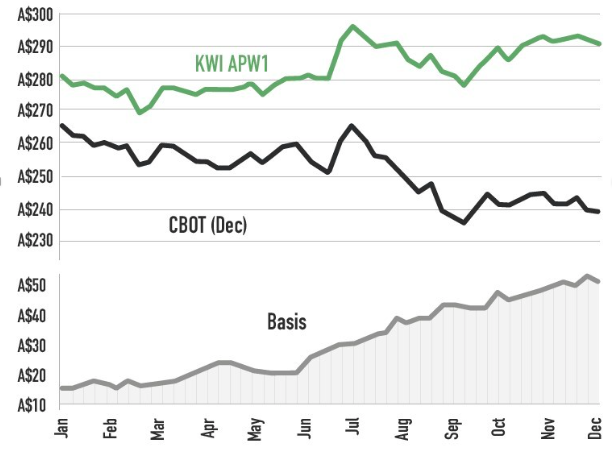 For example, Chart 1 shows six-year seasonality in Kwinana APW1 versus CBOT, and basis pre-harvest. In the six years prior to this year, from January to October pre-harvest, hedging has outperformed forward contracting in 55 months out of 60. For January-July, forward selling has outperformed in only one month in the last six years. On this occasion, forward selling outperformed by $2 per tonne versus up to -$67/t under-performance, and -$27/t on average. Farmers too readily give their position away pre-harvest when prices in relative terms are far too cheap. Price deciles are too limiting to initiate marketing decisions because markets shift and prices can trade at decile 10 levels or sub-decile five levels for long periods of time. For example, growers forward selling 2018/19 APW1 in Port Adelaide zone at $300/t in May through July because it was a 10-year, decile nine price, exposed their businesses to huge opportunity loss and/or excessive risk, as prices proceeded to rally more than $100/t. A more considered approach would have steered away from forward selling, because: from a relative value perspective we were too cheap versus global benchmarks at the time; our domestic balance sheet was the tightest in history; and the Australian crop was not in great shape. Chart 2: Hedging 2018/19 wheat outperformed forward cash selling. 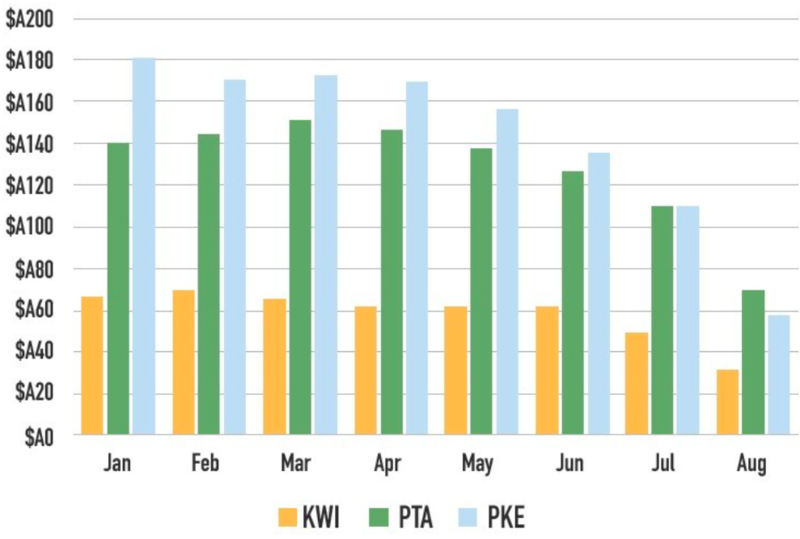 This chart shows better outcomes from hedging compared with cash sales for Kwinana (brown), Port Adelaide (green) and Port Kembla (blue) for transactions entered into in January 2018, February, March, and so on, as at 12 October 2018. Despite a lot of progressive farmers avoiding these pitfalls this year, much of the grower community is unfortunately learning some expensive lessons again, with $250-$300/t forward sales on the books in a $350-$450/t market. Of these growers, those who have production have incurred a $100/t plus opportunity loss, while those who don’t have compounded production failure with $100/t plus washouts. Chart 2 illustrates the outperformance of hedging versus forward selling this year. The other impact of cash-focused marketing strategies is the significant opportunity loss from not using derivatives post-harvest. Post-harvest hedging, for example, has proven to consistently add value over time. From a net-return point of view, no cash-focused approach to the market can compete with one that includes the calculated use of derivatives. Chart 3 shows the 10-year average cash selling at harvest/post-harvest versus hedging at harvest and unwinding post-harvest. Chart 3: Hedging at harvest time and unwinding the hedge during the marketing year showed improved returns compared with cash sales without a hedge. Examples here are 10 year average results for Melbourne and Kwinana. Click to enlarge. This is an edited version of an article originally published in the 2018 Harvest Issue of Market Check’s Australian Grain Review which can be viewed here .